Carlo Dolci, who trained with Jacopo Vignali, is generally considered the most important painter in 17th-century Florence. He primarily produced religious paintings, portraits and a number of still lifes. Among the latter genre is a Floral Still Life in the Galleria degli Uffizi in Florence that reveals Dolci’s knowledge of Dutch and Flemish art. He may have been familiar with such works through the collections of the Medici, and clearly studied their technique, use of colour and compositions. Among his first works executed as an independent artist are his portraits, a genre in which Dolci worked throughout his career and for which he was particularly esteemed. Among the best examples are the Portrait of a young Man, sometimes thought to depict Stefano della Bella, of 1631 (Galleria Palatina, Florence), and the Self-portrait of 1674 (Galeria degli Uffizi, Florence). However, Dolci produced his finest works in the genre of religious painting and it was compositions of this type that were most in demand from patrons and leading collectors of his day. In addition to works intended as altarpieces, Dolci popularised compositions with half-length figures of the Virgin, saints and other holy figures, painted in a precise, detailed technique that was well received in his day. The present canvas depicts a new iconographical motif that the artist developed. It depicts the Infant Christ holding a crown or wreath of flowers, evoking the crown of thorns and thus associating the Christ Child with his future suffering. 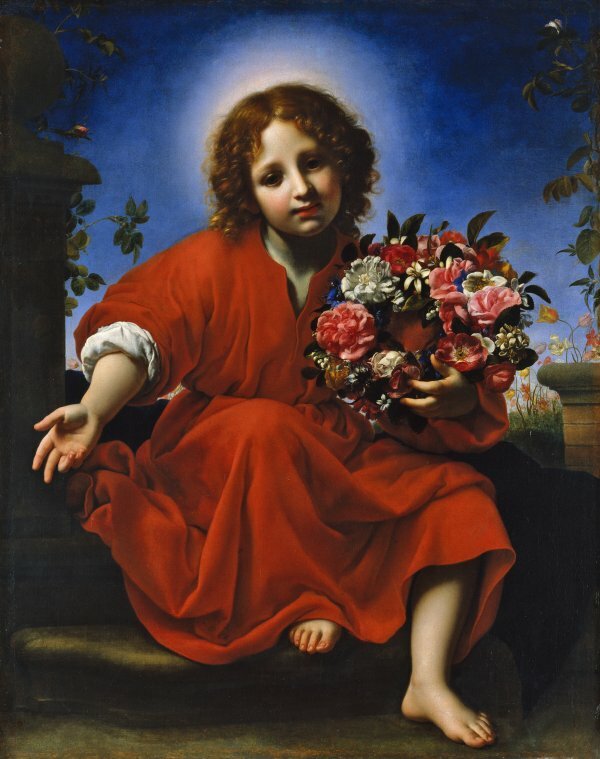 The subject of the young Christ imagining, holding or playing with objects related to the last episodes in his life was a subject that appeared in 16th-century art but which became widespread in the following century. Elements such as the cross, the crown of thorn, the nails and a bunch of grapes were symbols used by artists to associate the Christ Child with the suffering of the Passion. The present, finely painted canvas is of notable quality. It offers a synthesis of Dolci’s most typical characteristics, presenting the motif in a devotional and markedly spiritual manner. In addition, the artist used a smooth, enamel-like technique with an extremely high finish, as well as a delicacy of mood and a refined sensibility. The detail used in the depiction of the flowers and leaves in the wreath is continued in the rose bushes and wild flowers behind the figure of Christ in the garden, whose careful execution recalls the artist’s still lifes. The canvas has been identified with one described by Filippo Baldinucci that was sent to Venice. Various versions of this composition are known, of which the present example is considered to be the prototype. Among other autograph versions is the one in the Kunsthistorisches Museum in Vienna, dated a year after the present work, and a head of Christ in the Alte Pinakothek in Munich. Among the copies, according to Francesco Baldassari, are the two canvases in the Jack Bolton Museum of Art in Austin, and the Wadsworth Atheneum in Hartford.